It seems as if there has been quite a gap between releases recently, but the time has finally come for one of the most anticipated brands of the year, SP Authentic. 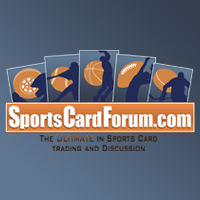 SPA has been a staple product for Upper Deck for many years now. Just like they do every year, collectors will be clamoring to complete their Future Watch autographed sets - a tough challenge, but one that can definitely be accomplished. Although these SP base cards retail their traditional white card stock, there's a lot more going on with their design. This year's base cards add quite a bit of color and movement. As you can see, there are lines crossing the card's background dynamically along with foil highlighting the player's name and position. I personally prefer a simpler design, but I can appreciate the fact that Upper Deck is trying to change up the feel of the cards a bit. This year's base remind me of the SPA base cards of the mid 2000's. I mention that fact in my video break of my box of it. Perhaps we're just back to that point in the design cycle! Overall it's a look that definitely falls in line with the look that SP Authentic has gone for - a solid effort this year - just not my personal cup of tea. The back of the base card is instantly recognizable as SPA - you can really just tell. Here the design is simple and easy to follow. 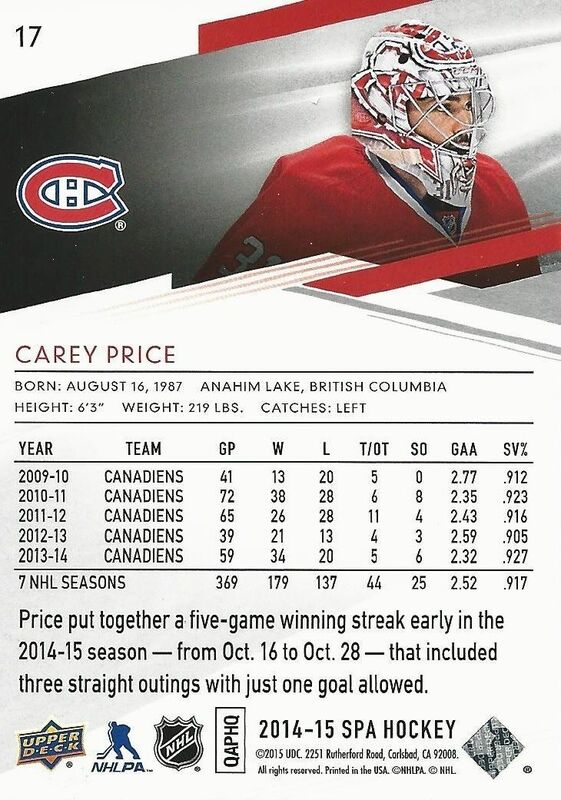 Upper Deck includes all the relevant information needed as well as a short write of below the player's stats. The back of the base card goes well with the front, and the same photo of the player ties the two together well. Is this back super exciting? Well, not really, but it certainly is functional and neat. No complaints, but nothing that wows either. 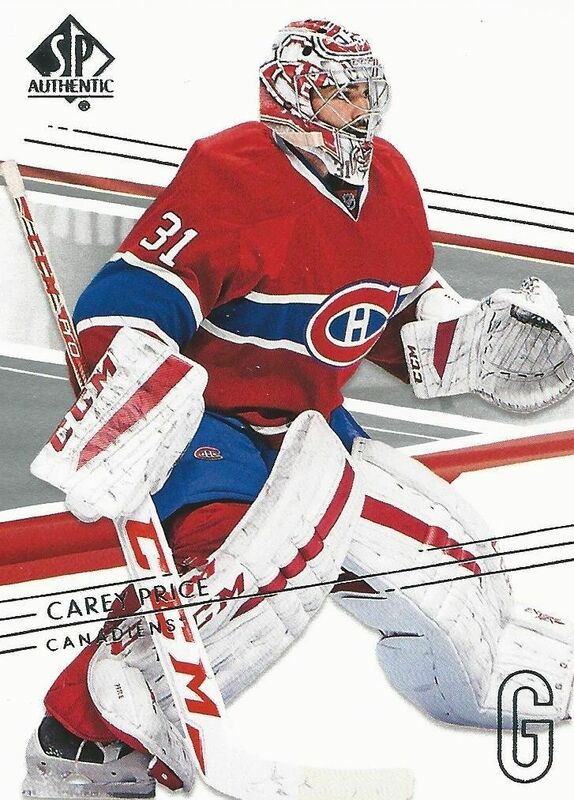 Last year Upper Deck started putting cards that featured full-bleed photography in the set. This concept returns with their 'Moments' subset. 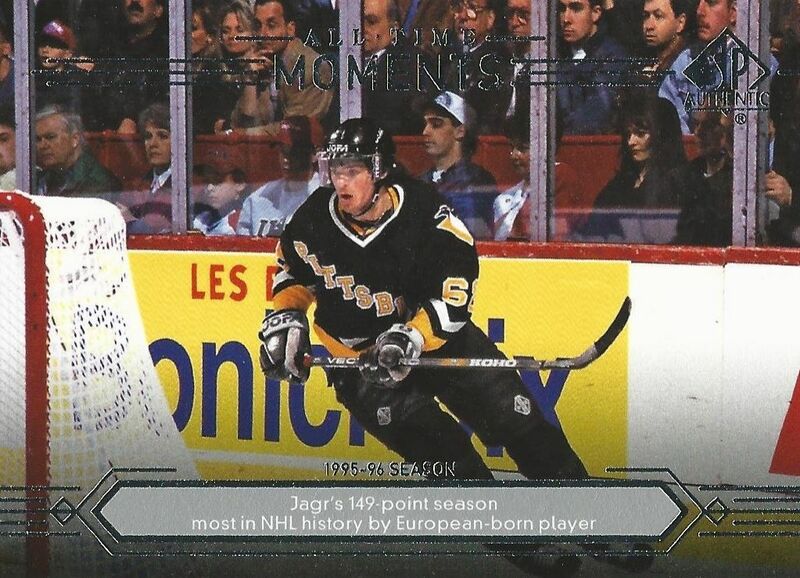 These cards highlight different important moments in NHL history. 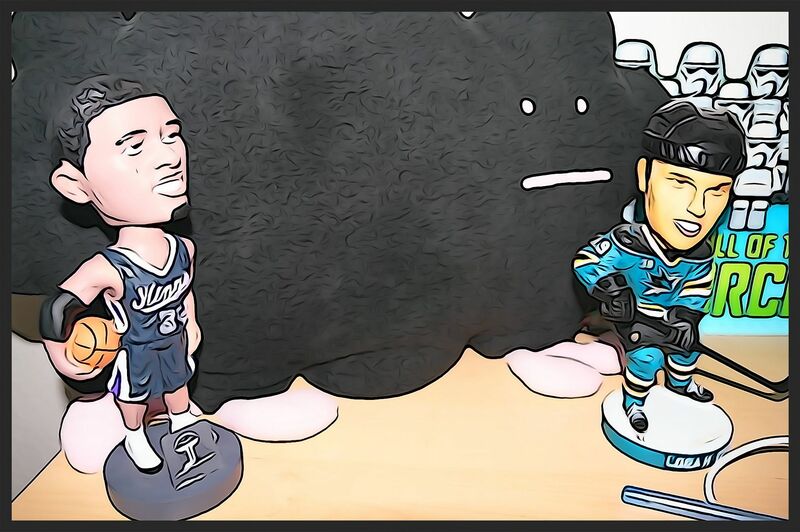 There are moments that span all through the history of the NHL. The cards look very nice, but have a distinctly non-SP feel to them. They are more in line with the standard Upper Deck Series 1 and 2 sets. These cards mix it up in terms of the basic set, but still feel a little out of place. 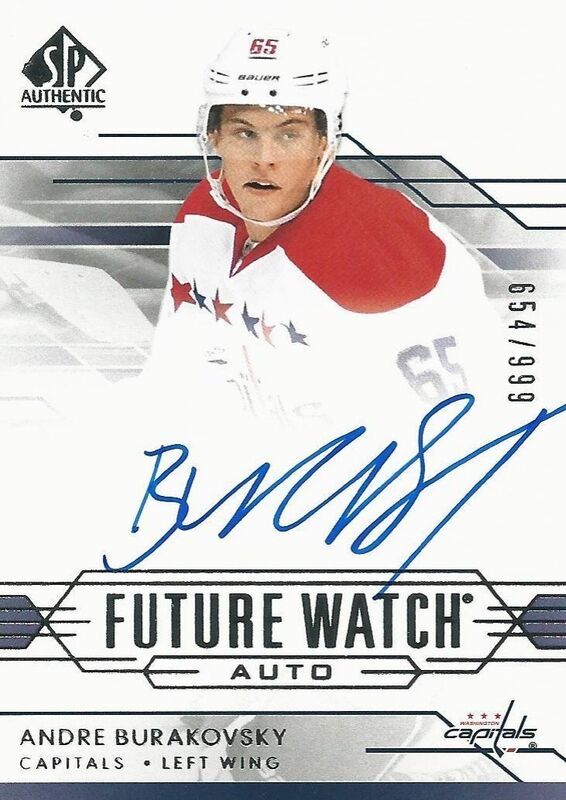 Just like in every other year, collectors will find b oth autographed and non-autographed versions of Future Watch cards in their boxes of SPA. The non-autographed versions of these cards are numbered to 999 and feature a design that I would say is even more dynamic than the base cards. 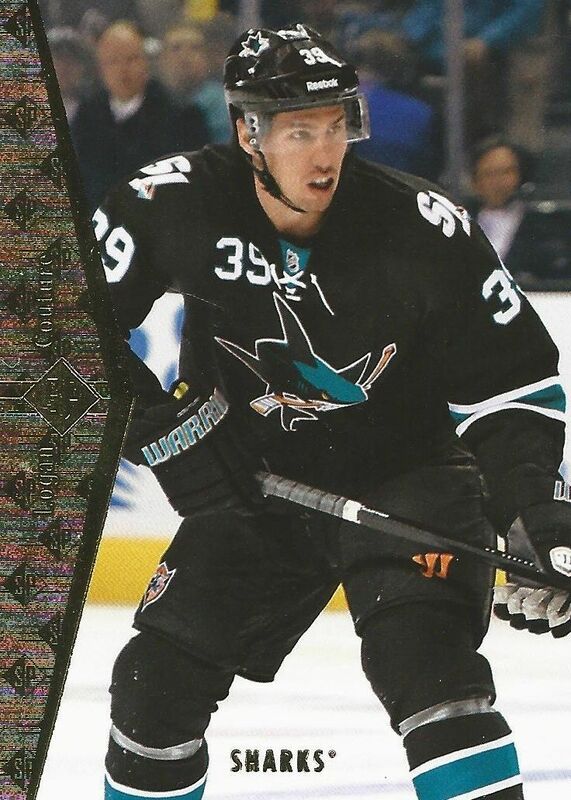 The lines on the card make it look like the player is speeding along on the ice. It's a pretty sweet effect. The autographed version of the FWA cards lose a bit of the speedy effect because the space for the autographed has been left blank for the player to sign. These cards are also numbered to 999 but feature an autograph in blue ink. These cards will be popular again as they always are. I do, however, find myself liking the non-autographed look a little better than the ones with a signature though. The box states that collectors will find three autographs inside with at least one being a Future Watch Autograph. In my box, I happened to get all FWAs as my hits. Boxes come with 20 packs in a configuration that is very similar to the UD Series 1 and 2 box. It definitely feels weird with that configuration. I liked the three rows of SPA packs! 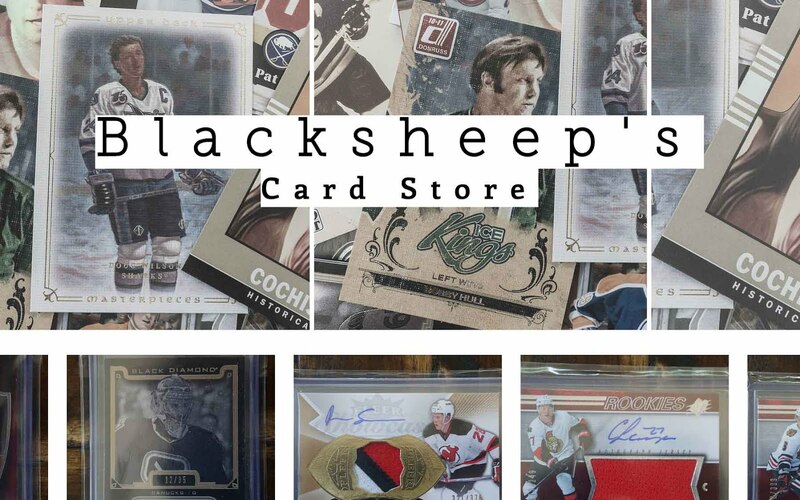 Retro cards have been a huge point of emphasis for many card companies, and that trend continues here as retro SP cards can be found in SPA boxes this year. These cards look like the old '94 SP cards with their gold foil side-border. It's a very accurate representation of what the cards used to look like! Prospect cards are also available in this same design as well with a special prospect stamp on the front. Die-cut and autographed versions of these cards can also be found as well. I was surprised to find UD Update cards in my box of SPA this year. Yes, Series 1 and 2 have already come out, but Upper Deck has given collectors an even more updated collection of cards for their sets. These cards really round out the Upper Deck set and act almost as a Series 3! It's nice to get both Young Guns and Future Watch cards in the same box. Pretty cool. Sadly, I didn't get any other types of hits in my box of SPA. I would have loved to get a Future Watch Patch card, but that didn't happen. Marks of Distinction and Immortal Inks are back along with Chirography and Sign of the Times cards - although it looks like this year's SOTT autos are actually pretty tough pulls! That's certainly different! It would have been really nice to at least get one different hit in my box, but that's just the way it is sometimes! SPA is pretty much the same reliable product that you can get every single year. If buying by the box, you're really taking a gamble on getting something good (as you could see by the box I got). Cases will yield much better results. If you're a collector who wants the FWA set, I definitely suggest just going for singles. Many of these rookie cards can be found for well under $10. SP Authentic is a solid set with nice potential and a great heritage. I definitely would recommend giving SPA a try. There are quite a few different hit types to get as well as some older re-inserted hits as well. All-in-all, you know exactly what you'll be getting with SPA - a solid product, on-card autographs, and a chance at some very sweet hits. nice box, nice product !! I really enjoy the new art style with more color! The update cards and other inserts and might have to pick myself up a box! Base cards look a lot better this year. I like that they added some more color to the cards this year and the update and retro cards are nice too. I like the future watch auto's a lot. Very nice review! I am from Washington and Andre Burakovskie is one of my favorite player! Good luck for your next review! Awesome Box! i nee to pick one of those boxes up! Nice box! I like the Hayes and burakovsky autos, they are two good rookies! I like the base design as well as the rookie updates! Overall, I thought it was a nice box! Thanks for the review! Nice that you got 3 Future Watch Autos! I think I'll pass on this one since it costs over 150$ and you don't get that much out of it. Still was fun to see it being opened. Nice break! I didn't think that box was all that great.. I do love the SP retro cards and the look of the base cards! love the product! hope to get it sone!! Good stuff! Can't wait to open my box of it! SP Authentic is a hit for me this year. I opened a box and got 4 autos, a future watch auto of Vincent Trocheck, Richard Brodeur retro auto, a Premier Prospects retro auto of Evgeny Kuznetsov, and a SOTT from last year of Ryan Murphy. I also got a Young Guns of Andrew Hammond aka the hamburgler. I like they changed the name of the authentic moments subset to modern moments and all time moments. I feel they heard the consumer's cry to make that change. I had fun opening it. More so than Sp Game Used and def more than Sp-X. My fav UD product this year! Base cards and inserts were great. I also love the future watch design and agree that the non-auto version does look a little better. Much better product than last year's sp authentic. Great hits, but i don't like the design of the box. 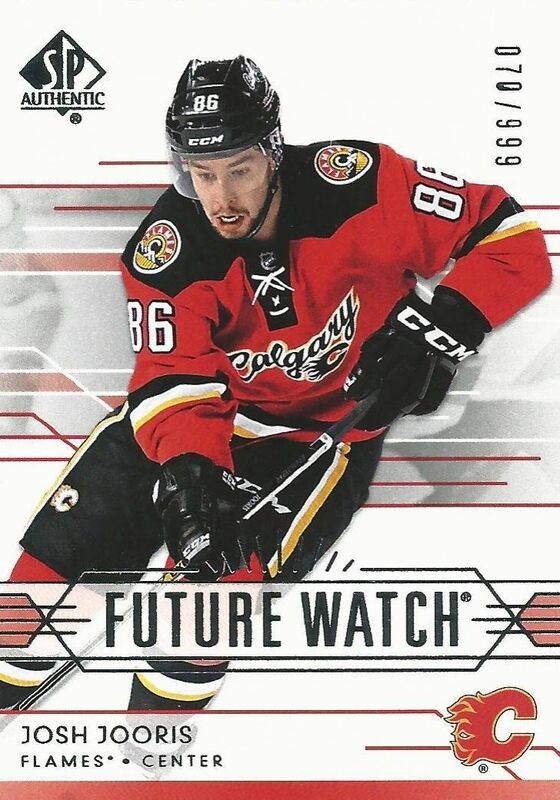 + It's good that they continue with the Future Watch tradition, since it's always good to have a product with that traditional on-card rookie cards. It's nice that Upper Deck put update cards in the packs. Great review of a great set. Rock on! 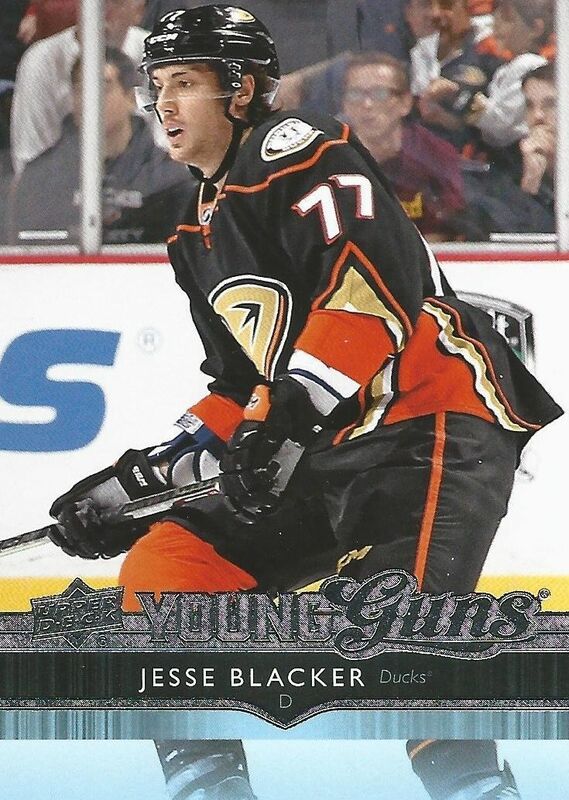 Really like the young guns updates as well as the future watch auto clean auto . Solid box of SP Authentic. Definitely would have liked to see a wider assortment of autographed hits but it still held true to its claims of 3 autograph hits with at least one as a FWA. Like the on-card autograph aspect with the hits compared to simply using sticker autos. Huge Caps fan and love that Burakovsky. The set isn't bad but personally UD is flooding the market with too many different sets and they can't even get all them out before the season ends. By the time they come out, a lot of the players have already been traded and whatnot. How do we know who won the hits? I am a Capitals fan and that Andre Burakovsky pull was awesome, as usual nice video and review keep up the good work. i will love to share my testimony to you all the people in world. 1.Trying to get pregnant 2. Infection 3. Blockage from the fallopian Tube 4. Cyst from the ovaries 5. Unpleasant smell from the virginal 6. Irregular menstruation 7. Infertility for easy Conception.. 8. skin diseases, Toilet infection and bad body odor 9. Fibroid 10.HIV AIDS heart disease difficulty walking double vision..